Don't forget about the online extravaganza sale going on now through Wednesday, November 23! I just finished placing my order and I'm so excited about the great deals that Stampin' Up! is offering! 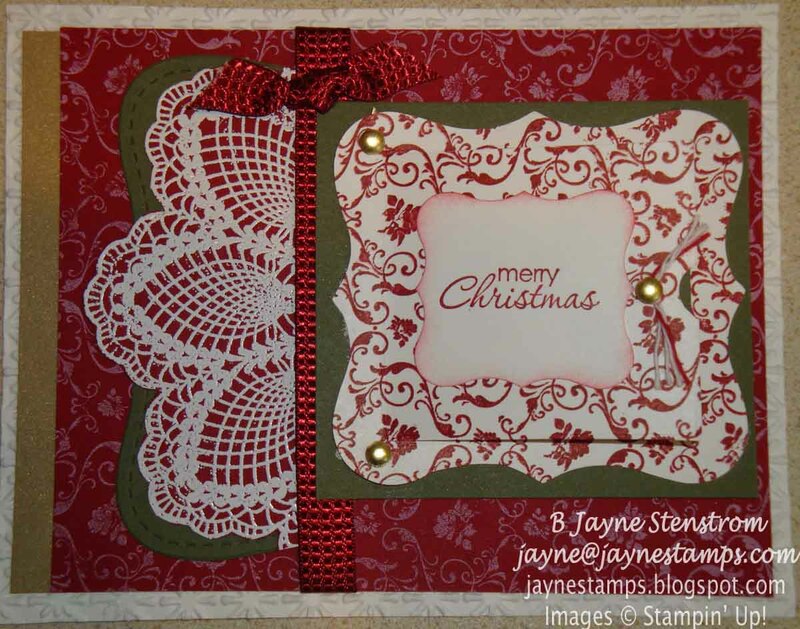 To place your order, just go to my demonstrator website at http://www.stampinup.net/esuite/home/jaynestamps/ and click on the Shop Now button in the top right-hand corner. You will be able to see the items in the online extravaganza by following the links. And you can also order other items that are not in the "sale" - so if you need more cardstock or SNAIL adhesive to finish your Christmas cards, you can easily add that to your order. But you've only got until midnight Wednesday, so don't delay! I also have a beautiful card to show you today. This is another one that Lou Ann had, so I don't know the creator of it. Isn't it gorgeous? And it uses the adorable Peekaboo Frames Bigz L Die, so here's a little surprise under the Merry Christmas! 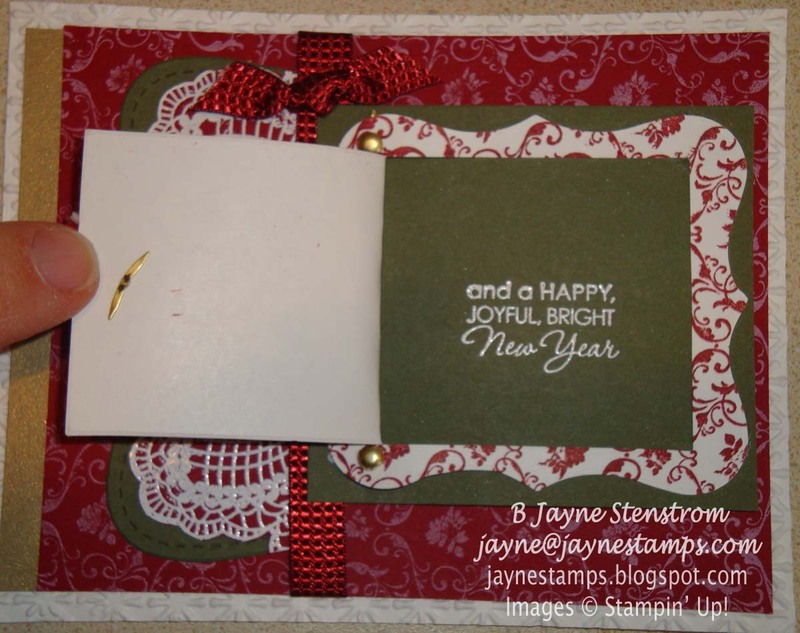 The background is stamped with the Parlor Prints stamp in white on the Cherry Cobbler and in Cherry Cobbler on the Whisper White (I love how this looks here!) 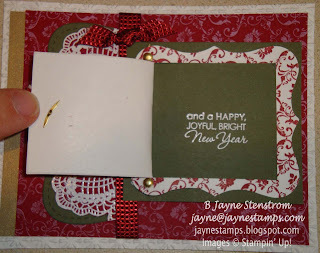 She also embossed the Hello, Doily stamp with white emboss powder and cut around it. There's some Always Artichoke cardstock cut with the Top Note die behind that. The Cherry Cobbler 3/8" Quilted Satin Ribbon tied around the middle looks gorgeous! 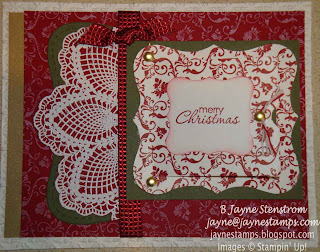 The sayings are from Petite Pairs and the Merry Christmas was stamped and then punched out with the Curly Label Punch to coordinate with the Peekaboo Frame she used. Simple cards can be beautiful, but sometimes you might want to take it up a notch and add some extras like this stamper did. I think this card came out beautifully! Hope you enjoy!